After gaining enough popularity through IAC movement led by Anna Hazare, Arvind Kejriwal broke away from the India Against Corruption (IAC) movement and started his own political party, ‘Aam Aadhmi Party’ (AAP). Within a few months of forming the party, AAP surprised the whole nation by securing 28 seats (29.5% vote share) out of 70 seats in the Delhi Assembly Elections. Since BJP with 31 members refused to form the Government, AAP formed the Government with the outside support of Congress (8 members) and won the vote of confidence in the Assembly too. IAC movement has set the entire nation to fight against corruption. The AAP youngsters led by Arvind Kejriwal brought confidence on the people that they would bring some change. AAP and Arvind Kejriwal got a wonderful opportunity to prove to the nation their capabilities through good governance. But they seemed to grow obsessed with media coverage, as they started looking at every action keeping the media in mind, without looking at the governance aspect. They did not understand the risk of the media and that the same media which glorified them could also shame them. Probably, since they were under pressure to implement the un-implementable election promises, they started resorting to ‘attention diversion’ and childish tactics, like Janata Dharbar, raids of schools, hospitals, etc. 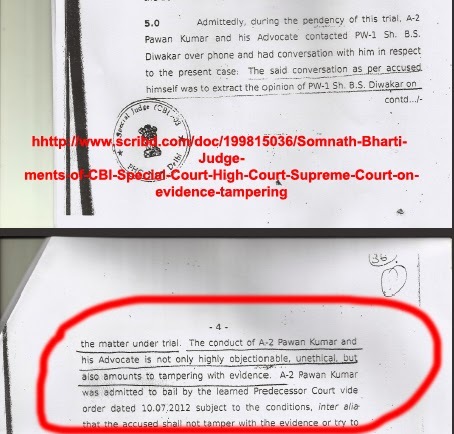 CBI courts criticism on Somnath Bharati, the Law Minister for tampering the records, his illegal orders to Police in the mid night to arrest African ladies have all come up for serious criticism and brought embarrassment to the party. Chief Minister Arvind Kejriwal’s dharna in the prohibited area defending the actions of Somnath Bharati and calling himself as ‘anarchist’ has further created confusion among the people, who had reposed highest confidence on them. Chief Minister’s call to police force to join the dharna, his declaration that he would derail Republic Day celebrations, Prashant Bhushan’s comments on Kashmir, open invitation extended by Bhushan and Anjali Damina to Maoists and Davood Ibrahim have further raised the doubts among the people about their real agenda. A case is also pending against Arvind Kejriwal in Delhi Court on charge of plagiarism for the book ‘Swaraj’. His recent statement in support of illegal ‘Khap Panchayats’ has added further controversy. Hoping the AAP would be a different political party with more maturity, many eminent people and the middle class section of the society supported AAP earlier. Though they may all enjoy freedom, they are yet to understand that freedom and violation have a thin line of separation between them. If they continue to function in this reckless manner, people would lose confidence in any future social activists turning out to be politicians. Under the Indian law, only Indians can donate to the Indian political parties. 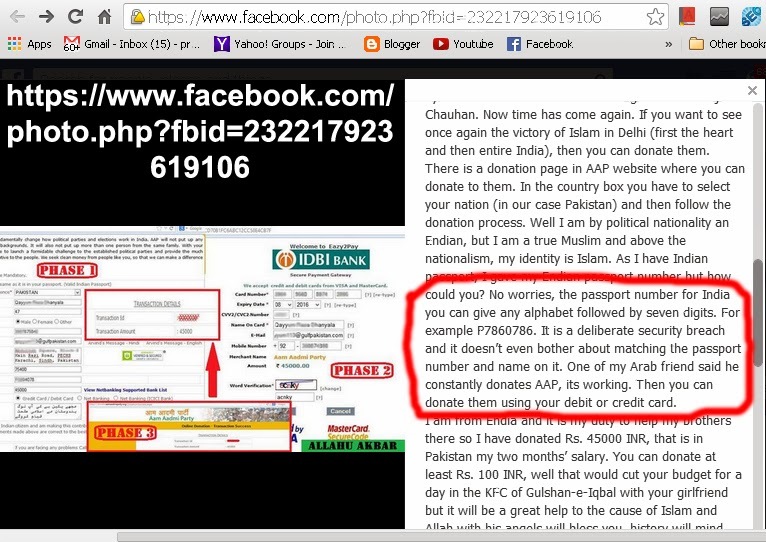 It is alleged that during the election time, Pakistan-based separatists encouraged their people through the Facebook (shared 955 times) to fund AAP with false Indian Passport number (by writing one letter of the alphabet followed by 7 digits), to falsely identify themselves as Indian nationals. Since the AAP site did not have any mechanism to validate the passport number, many Pakistan-based terrorists are suspected to have funded AAP during the elections. This allegation is now being investigated by the Government of India. The leaders of AAP should have learnt their lessons from the history of our nation. In the past, India faced two types of people’s movements. One was based on ‘regional aspirations’. Political parties like DMK, TDP, AGP and BSP were formed by the regional aspirations of strong leaders. Though these parties might have undergone splits, they still continue to be powerful political forces in India. The other type of movement was focused only on a single agenda. In early 1970s, Lok Nayak Jayaprakash Narayan called for a ‘total revolution’ to fight against Indira Gandhi’s regime. Many senior political leaders with a huge following came together to form the ‘Janata Party’ in 1977 and secured a massive victory in the Lok Sabha elections after the emergency, defeating Indira Gandhi. Within a few months after their victory, they got disintegrated due to lack of focus and future plans for the country. In 1985, VP Singh, another mass leader formed the ‘Jan Morcha’ to fight against corruption in Rajiv Gandhi’s regime. They also won to form the Government at the centre. After a few months, they got disintegrated and lost power for a similar reason. Both these parties / movements are not in existence today. Political history loudly indicates that any political movement with a single agenda cannot survive for a long time. The political movement should have effective leadership with clear policies on various issues. It is surprising that AAP, without clear leadership and policies on various issues, is now calling itself the third force at the national level, after the Congress and the BJP. It is also surprising to see the media project AAP as an alternative to the Congress or BJP, when AAP has not yet set up even its party units in the other states. AAP’s claim of having more than one crore members has become a mockery. 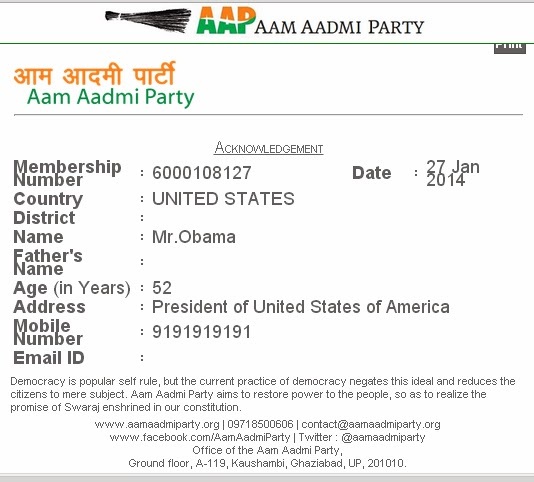 The social media is now flooded with AAP membership cards in the names of President Obama, Jayalalitha, Sonia Gandhi, Mayavati, Rahul Gandhi and Narendra Modi. We also found it very easy to obtain a membership card in the name of President Obama. Such a membership drive reduces the credibility of the party. Even the traditional national parties do not claim to have such huge membership. When AAP talks about transparency, many of the critics also accuse them of lack of transparency in the functioning of the trusts owned by Arvind Kejriwal and Manish Sisodia. Arvind Kejriwal created 3 NGOs viz. Parivartan (1999), Kabir (2005) and Public Cause Research Foundation (2006). He was also given Ramon Magsaysay Award in 2006. When somebody questioned about the purpose of the funds in the Court, the Delhi Court ordered the Government to investigate it. The websites of Parivartan and Kabir are now closed. The Government of India seems to be investigating on violations. connectivity between CIA, Ford Foundation, Magsaysay Award and some AAP founders still remains without proper clarification and shrouded in mystery. The President of India in his Republic Day speech cautioned in general that ‘anarchism’ cannot be a substitute for ‘governance’. We also observe from the social media that some of the young people and even intellectuals hail and justify such ‘anarchism’ and immature acts of AAP leaders under the pretext that the country needs a change and a new type of politics. India is the largest democracy in the world with more than 130 crore people. Braving many internal and external challenges, India has shown progress in various fields at the global level. Although we may have more unresolved issues, they need to be tackled in a mature way without creating chaos. In the past 65 years, many leaders have shown effective leadership by taking the country to the next level. Without any hullabaloo, Narasimha Rao (Prime Minister) handled the financial crisis of the country in early 1990s and took the country to the next stage of economic progress through his mature and effective leadership. Justifying the wrong actions of any political party is quite dangerous and risky. Creating an impression among the new-generation voters that anarchy is a heroic deed is dangerous. Internal and external enemies and terrorists wait for an opportunity to destabilise the nation. The founding fathers of the Indian constitution have carefully drafted the Constitution to provide ample solutions for any crisis. Arvind Kejriwal and his team should not play to the galleries. They are no longer activists. They should realise that activism is different from governance. Just like they were watching the rulers closely as activists, now people have started watching AAP also more closely. The people have given them constitutional responsibilities to govern the Delhi State. Instead of creating a pandemonium before the cameras, they should sit and calmly discuss with experts and officials to solve the problems one by one. They should transparently come out with their own past and present financial transactions before blaming others and to avoid allegation against them. The nation expects more from them, to bring the desired change.